Browse through the Table of Contents or go straight to the full text of the memoir. Some photos and explanation of a mine mechanism. In 1975, Sir Charles founded 'OPUS'. This pamphlet was published by that organisation the same year. 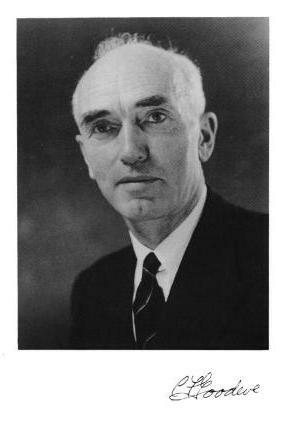 "First Operational Research Conference, Oxford 1957"
Sir Charles was in charge of organizing this conference in the emerging discipline of Operational research. The above link is a photo of the "Front Row" of participants. Here is a larger (much larger!) photo of all the attendees with mouse-accessible names attached to most. as it was installed on the USS Slater. "BISRA — The Immortal Memory"
The pages are maintained by Peter Goodeve (his son).